A new international initiative by Madanes School! In recent years, healthcare systems in Western countries have seen tremendous, unprecedented changes. Technological, economical, social and political forces are behind those changes. This new international health care environment presents many challenges to all the actors involved. Patients are shifting from being passive to becoming active participants in medical decision making. New legal, regulatory and accreditation standards put stress on health care organizations, who are challenged to improve both patient safety and health care outcomes while respecting bottom lines. Physicians are pressed to perform under tough time and financial restrictions. its therefore imperative that doctors reduce their exposure to medico-legal problems by acquiring sound communication skills. Since the appearance of the Toronto consensus statement and until today, a new paradigm is emerging, according to which the new physicians not only need to possess good technical and clinical knowledge, but also a humanistic and emotional intelligence that will allow them to work effectively with patients to reach the best health care outcomes. ● Provide cutting-edge consultation skills to deal with all types of patients and conduct a professional yet sensitive patient-centered practice. ● Enhance inner resilience in any stress situation. ● Rekindle motivation and the fervor for helping people that every professional has at the beginning of his or her career. The needs of patients: Madanes tools result in a better interaction between health professionals and patients, and as a result the latter health outcomes are greatly improved. Good communication with the patient increases compliance and adherence to treatments and of course, greatly reduces the risk of litigation. The needs of health-care organizations: Leadership and good teamwork are the foundations for any excellent, functional and focused organization. 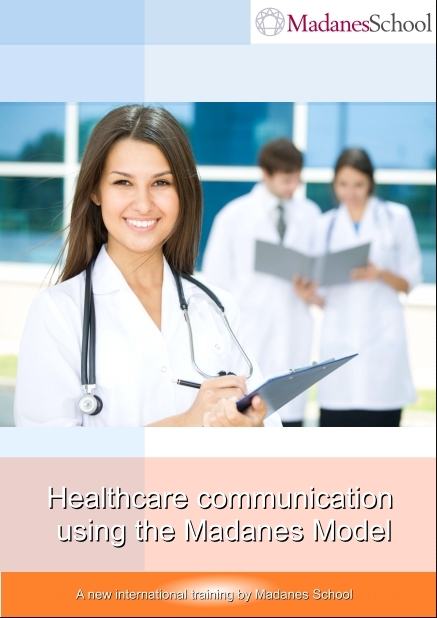 "Using the Madanes Model in Healthcare Communications"